Most people prefer to handle BizTalk as a Black-box and don’t have a clue of what’s going on (or don’t want to ) inside the SQL databases. The overall performance of BizTalk very much depends on the performance of its databases, managed by SQL Server. As BizTalk operations are asynchronous processes by nature, SQL Server and the underlying infrastructure strongly determines the overall throughput of BizTalk. 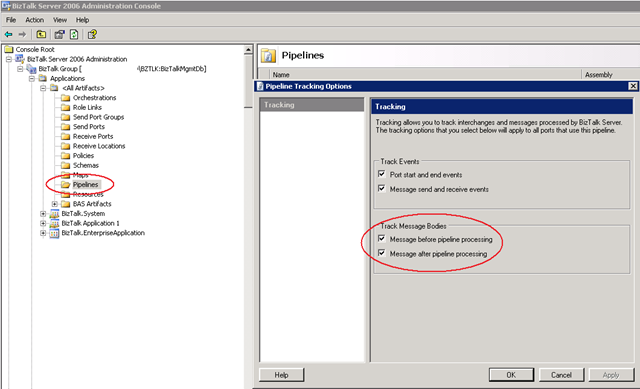 During BizTalk Quick scans & Performance optimization projects at customer production sites we noticed that there’s typically a lot of load thrown at SQL Server simply because full message body tracking (MBT) is enabled, storing lots of unnecessary debug & trace data that nobody ever will have a look at. Collecting MBT data in a production environment isn’t a recommended setting (except of course, if you are troubleshooting …). 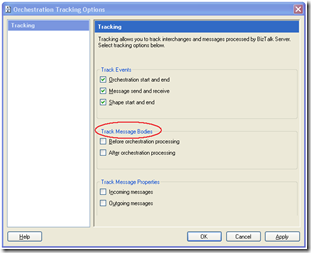 So in many cases a quick fix to reduce the overall BizTalk workload significant and to speed up the overall environment is to check if message body tracking is enabled and where possible, to turn it off. We have seen BizTalk environments that came to a stall completely because of MBT and and also sites where 60% of all the SQL transactional load was caused by MBT. But some of the interfaces are maybe used only once a month, so we should look for a method that is more accurate. 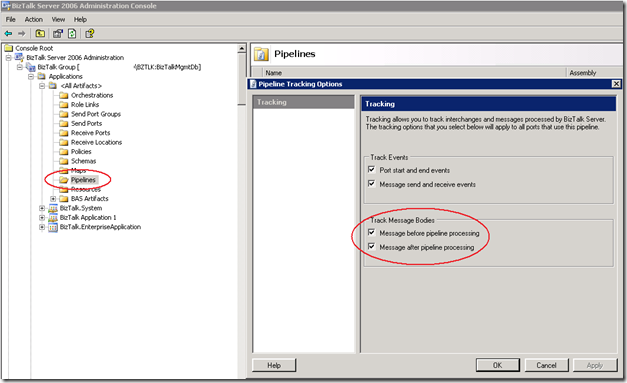 Root cause analysis: which artifacts have tracking enabled? 2) The easy way: let a SQL query do the work for you! If you have many artifacts (hundred’s) to look after you might want to check them all periodically with a query, which we would also like to recommend to include as a formal sign-off item on your check list for new deployments. 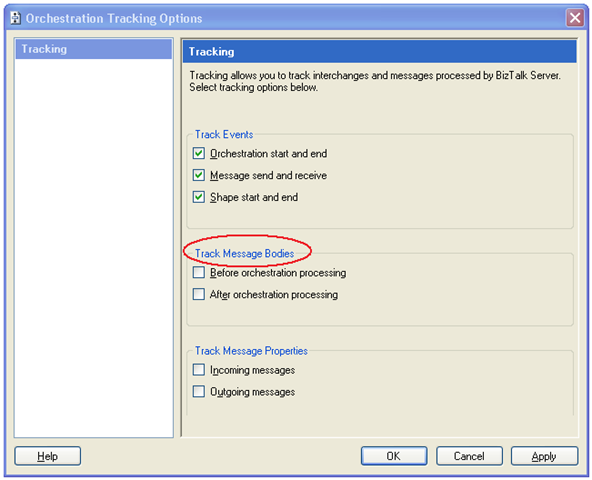 Message body tracking options for orchestrations and pipelines are stored in the BizTalkMgmtDb Database, to be more precise, in the ismsgBodyTrackingEnabled column of the StaticTrackingInfo table. The value of the integer column indicate which kinds of tracking are enabled. The first two bits of this number indicate whether tracking is enabled before (bit 0) or after (bit 1) processing. 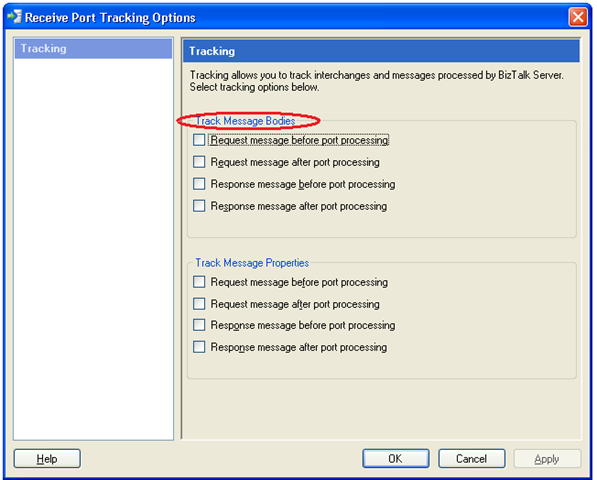 Increase the IT-efficiency of your BizTalk environment(s) by checking the Message Body Tracking settings. The above query will provide you a list of all the artifacts that have tracking enabled for you quickly, before you even finished your first cup of coffee. 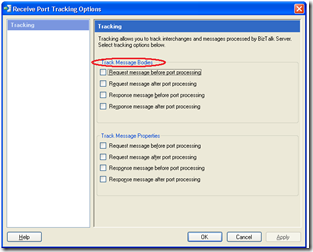 Disabling unnecessary tracking will reduce the overall load on the BizTalk SQL Server tracking database, and therefore also reduces the network, disk and CPU load significantly.